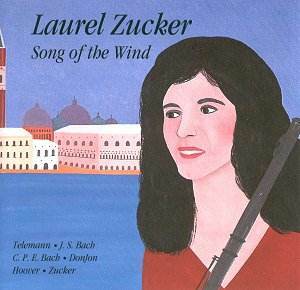 This CD of music for unaccompanied solo flute played by Laurel Zucker offers a chance to hear a number of seldom-heard and little-known works as well as some more familiar music. Originally recorded some time ago and released back in 1994, Zucker, a virtuoso American flautist, plays a selection from J. S. Bach onwards. While an entire disc of unaccompanied flute music such as this might be considered by some to be a little much, this considered selection, and the all-round fine performances and recording quality, provide a pleasant surprise. More than half of the music on this disc was written in the eighteenth-century. While some of the performances are extremely satisfying, there is, however, the ever-present issue of these works being played on a modern flute; so this disc may not prove to be to everyone�s tastes. The disc opens with two short works by the nineteenth-century French composer and flautist Johannes Donjon. Both Elégie and the title work of the disc, Song of the Wind combine an acute lyrical sense with flowing virtuosic writing, admirably executed. These two works by Donjon and the later work by Katherine Hoover (Kokopeli), frame a selection of movements taken from the first, third and fourth of J. S. Bach�s Cello Suites. The Cello suites show themselves to be versatile works and they transfer fairly convincingly to the flute, providing further opportunity to display Zucker�s technical and lyrical capabilities. Written in 1990, Kokopeli demonstrates the American composer and flautist Katherine Hoover�s plentiful knowledge of the flute�s capabilities in a suitably atmospheric way. Most of the rest of the disc contains more music from the eighteenth-century in the form of Georg Philipp Telemann, J. S. Bach and his son Carl Philipp Emanuel Bach. Zucker continues to show herself to be in command, with immaculate and careful phrasing and articulation that makes the most of this repertoire. Particularly impressive is the Sonata for Solo Flute in A minor of C. P. E. Bach, while the selection of Fantasias by Telemann provides a mostly more reflective and wistful impression. The Partita in A minor of J. S. Bach does not shine forth as brightly as the other Baroque works in this recording. The dance-like qualities are not always effectively and consistently portrayed. A composer in her own right, the disc closes with a short work by Zucker � Pandora�s Box. Its improvised nature, shows effectively how a relatively low and small range on the flute can produce a varied array of sounds and nuances. A substantial and impressive biography of Laurel Zucker could perhaps have been complemented with at least some notes about the music. Nevertheless a recommended introduction to the music-making of this fine player.